The Pentagon's climate change plan is great, but will it be easy to ignore? The Pentagon’s Climate Change Plan Is Great. But Will It Be Easy to Ignore? Aside from the snide hyperbole, the truth is, some of the critics have a point. The military should not be a utility tool, hauled out for every situation that needs fixing. That blunts the tool itself, not to mention that the military is not the best tool for every situation. That’s exactly why this new report is so good: It does not, in fact, call for a cryospheric war. (You can see a report on the State of the Earth’s Cryosphere, or snow and ice, here.) Instead, it spells out a legitimate military role in dealing with global climate change. In a nutshell, the Pentagon’s report says that U.S. armed forces need to better understand how a changing global climate will affect them, and just incorporate that into how it does business..
First, that applies to the more than 28 million acres of Department of Defense land, and that kind of stewardship is nothing new for the military. The report points out, for example, that the codes that govern military construction have already been updated for climate change. That may not sound like a terribly bold action, but given that the annual military construction budget is in the billions and there are bases in every state, it can be a sizeable investment in resilience. And it’s hard to see why anyone would object to improving flood control measures in an area that’s seeing more frequent or severe flooding. What’s different about this report is that it goes beyond the bases to look at how climate change might actually shape military missions. That includes climate impacts, such as lower crop yields or decreased access to water, which may destabilize populations and provoke local or cross-border violence. Most directly, climate change may mean an uptick in military humanitarian and disaster relief missions, such as the relief efforts for Superstorm Sandy. The report basically directs the Department of Defense to incorporate such considerations into how it plans for the future. And regardless of how fraught the present is, the Pentagon is always planning for the future—and more to the point, budgeting for it. I saw that firsthand in my time in office as an Assistant Secretary of Defense. The Adaptation Roadmap offers a sensible approach, and it may actually save the taxpayers money. It is, after all, cheaper to be resilient to a natural disaster than it is to respond to one. It doesn’t cost any more to design a warplan that takes potential refugee movements into account than one that doesn’t. And it would allow U.S. forces to be far more efficient and effective about humanitarian and disaster relief missions if they identify the equipment and personnel needs for such contingencies in advance. This is not to say the Pentagon’s climate roadmap is perfect. It is fairly typical of the compliance report genre, with its creative repackaging of ongoing initiatives and buckshot of declarative intentions. There are, for example, 20 “must do” bullets, but without any detail about who will do what by when and how. Passive resistance to this kind of report is not uncommon in the Pentagon. Appropriately enough, Hagel’s speech about the report’s release took place in Peru—an ideal location not so much because there is an important international climate negotiation there in December, but because much of the region is in the grip of a prolonged and destructive drought. And that points to the bigger picture. 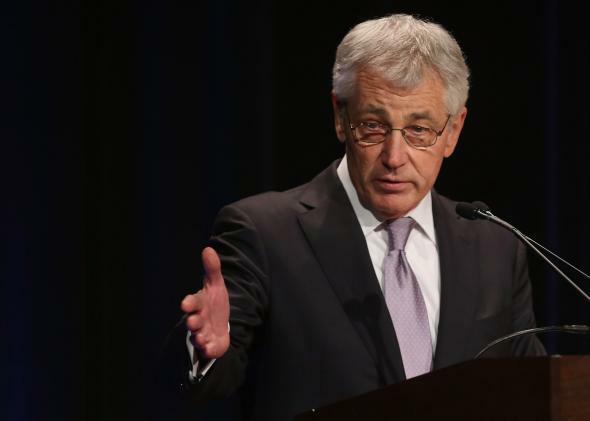 Ultimately, the most dramatic potential effects of climate change Hagel described in his speech—loss of water supply, crop failures, migrations—require something other than a military response. But the United States really only has one utility tool. There’s a reason it’s 4,000 soldiers in Liberia helping contain Ebola, and not 4,000 State Department or USAID or public health service personnel. Not that these institutions lack talent or commitment—they just lack capacity for this kind of mission. You can blame Congress or the last three administrations for failing to really establish a robust civilian disaster and stabilization expeditionary force, but it’s the American people who don’t seem to have the stomach for it. We are, as a nation, simply more comfortable funding the military. But this is going to keep happening: Hurricanes will hit allies and trading partners and American cities, war-torn societies will spread destabilization, and epidemics will travel. Perhaps it is time to admit that not only have we been using our military to deal with these problems, we are likely to continue doing so. There have been calls in the past to stand up a brigade-sized military force specifically for stabilization and disaster relief missions, one that could draw on a different recruiting pool and training regime. Maybe it’s time to revisit those proposals and come up with the right vehicle not only for a climate change roadmap, but for Ebola and other nonmilitary security threats.